What is the REVEAL-SCAN Study? “Risk Evaluation and Education for Alzheimer’s Disease – the Study of Communicating Amyloid Neuroimaging” study (REVEAL-SCAN for short) is a clinical research study enrolling people ages 65 to 80 who have normal cognition and a family history of Alzheimer’s disease (AD) dementia in a parent or sibling. 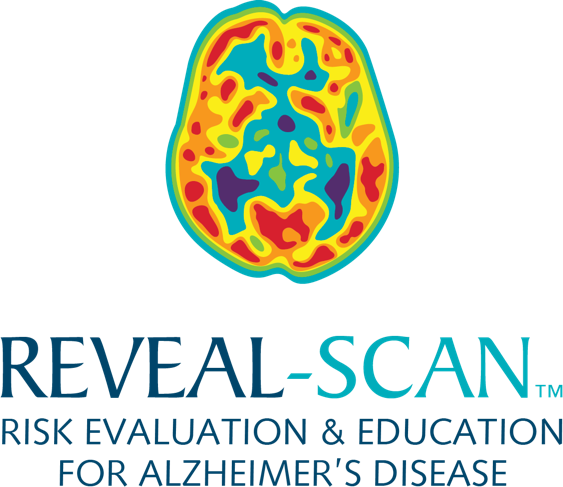 The purpose of the REVEAL-SCAN study is to understand how people respond to learning their risk of developing AD and the result of their amyloid brain imaging results. Alzheimer’s disease is the most common cause of dementia. Studies have shown changes in the brain happen many years before a person shows the symptoms of AD dementia. One of these changes is the buildup of a protein called “amyloid,” which scientists believe may play a key role in the later development of Alzheimer’s disease dementia. An individual risk estimate for developing Alzheimer’s disease dementia by age 85 based on their current age, race, gender, and family history. Half of the participants learn these two results at the start of the study, and the other half will learn their amyloid brain scan results at the end of the study. Participants are randomly assigned to one of these two groups. Understanding how people respond to learning their risk of developing AD dementia and amyloid positron emission tomography (PET) scan results will help researchers design better treatment studies in the future. What does it mean to have an “elevated” or “not elevated” level of amyloid in my brain scan? What is my risk of developing AD dementia? Participants will be paid $200 if they complete the study. They will be compensated at the conclusion of their study participation. If they do not complete the study visits/procedures, they will receive partial payment for the portion(s) of the study visits/procedures they have completed, if applicable. Reasonable costs of travel to and from study visits at Brigham and Women’s Hospital will also be covered by the REVEAL-SCAN Study. If participants are driving to study visits, valet parking is provided at no cost. How Do I Find Out More About the Study? You can visit www.genomes2people.org/revealscanproject/ for a summary of REVEAL-SCAN and a downloadable brochure that describes the study in greater detail. The Principal Investigator for the REVEAL-SCAN Study is Robert C. Green, MD, MPH.